How will we educate our child? Let me begin by saying that having educational choices to navigate is a blessing. Many parents must both work full time to support their family or are raising their child without the support of a spouse. Often, the only option available is public school. So, when you find yourself struggling between the various options, it’s good to remind yourself, It’s a blessing that I have this decision to make. That doesn’t mean the decision is easy. It’s difficult and sometimes overwhelming to sort through the possibilities. Most of the time, we’re considering three options: public school, private school, and home-schooling. Every option has potential pitfalls, as well as advantages to consider. Each child is different and every family unit has a unique set of circumstances influencing their decisions. Therefore, it’s important to remember the wisdom Romans 14 offers on disputable matters: “So then each of us will give an account of himself to God. Therefore let us not pass judgment on one another any longer, but rather decide never to put a stumbling block or hindrance in the way of a brother” (Rom. 14:12-13). I have friends whom I respect and admire that have made each of these educational choices (in some families they’ve switched between the options at various stages). Our goal is not to do what those around us are doing. Our goal is to thoughtfully consider what the Lord would have us to do. This process takes time. It takes time in Scripture, listening to the Lord. It takes time in prayer, asking the Lord to guide us. It takes time in fellowship with others, seeking wisdom and advice from those who have gone before us. Whatever decision you make, it’s important (and sobering) to remember that you are the greatest influence in your child’s spiritual development. Whatever educational option we choose, every Christian parent is instructed to train his or her child about God (Deut. 6:4-10). Each day, in the way we live, the way we speak, and the habits we display, our children are learning what it means to follow Jesus. More important than the school choice we make, it’s always good to consider, What is my life teaching my child about God? What theology am I living before my family from day to day? 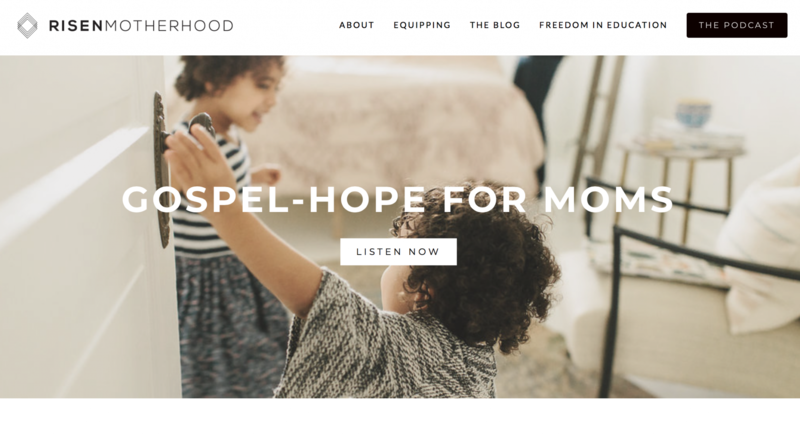 If you’re in the process of making the school decision, I’d encourage you to tune in to the recent podcast series at Risen Motherhood with Laura Wifler and Emily Jensen. They interviewed Jen Wilkin about her choice to educate through public school, Irene Sun about home-schooling, and I had the pleasure of chatting with them about our decision for private Christian education. I’ve listened to all of them, and I learned so much from each of these women as they shared about their decision-making process. Emily and Laura have also compiled a wonderful list of resources to help as you weigh educational options. They’ve collected multiple articles to read about each option, as well as other related resources. One of my favorite items is their Educational Questionnaire. It has so many helpful questions to consider—from your personal motives and fears to your life circumstances and individual needs of your child. It’s so helpful. It made me wish Risen Motherhood existed when I had young children—they have so many excellent podcasts on a variety of topics! As you weigh all the options, I encourage you: Read the Bible. Pray for wisdom. Listen to advice. Most of all, trust the Lord with your children. He alone can open hearts. He alone can save. Cry out to him, for he is able.